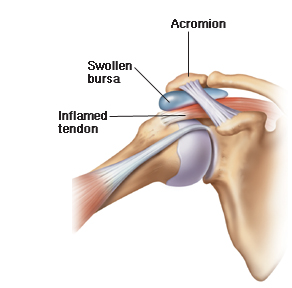 Shoulder Impingement occurs when one of your rotator cuff muscle tendons becomes pinched, or impinged, between the bone in your arm and your shoulder blade. The friction on the muscle can cause increased pain and inflammation when lifting up the arm as the muscle becomes pinched between the two bony landmarks. If you feel pain in the front of your shoulder when lifting your arm overhead, it may be caused by shoulder impingement. It is important to address the cause of shoulder impingement, as repetitive stress on the muscle can lead to a rotator cuff tear. Repetitive overhead movements performed during sports such as swimming, baseball, tennis, and volleyball, or during such activities such as overhead weightlifting or painting. Weakness of the rotator cuff muscles, causing decreased shoulder stability and abnormal shoulder mechanics. An injury or fall onto the shoulder. Bony abnormalities that narrow the space underneath the shoulder blade. Reducing pain and inflammation in the shoulder through modalities such as ice, heat, and electrical stimulation. Patient education on which activities should be performed and which should be avoided. Restoring range of motion to the shoulder through exercise and manual therapy. Promoting normalized movement patterns with proper body mechanics. Strengthening the shoulder complex and rotator cuff to increase shoulder stability and prevent further injury. Knee valgus is characterized by your knee collapsing inward when your hip flexes. You may also notice that the opposite side of your pelvis may collapse downward. This is seen most often in squats, lunges, jumps, landing, and descending steps. Women are more susceptible to knee valgus because women have a wider hip angle compared to men. Knee Valgus can lead to patellofemoral knee pain, ACL tears, and IT band syndrome. 1. Weak gluteal muscles allows for over compensation of inner thigh muscles pulling the knee inwards. 2. Restricted ankle mobility does not allow for knee to progress forwards over the toe. 3. Inadequate quad strength (specifically vastus medialis function) effects knee stability and can cause the patella to track improperly. 4. 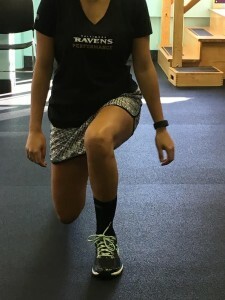 Weak hamstrings may similarly allow the knee to cave in. 5. Improper motor planning of movement and poor execution of movement. A physical therapist can help address the causes of knee valgus and provide exercises to minimize the symptoms and effects. This can be done through strengthening, stretching, and proper training of movement execution.